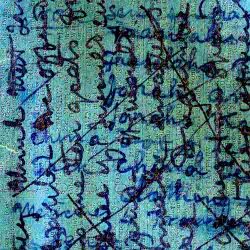 As the final table on the previous page shows, Livingstone appears to be consistent in the type of ink he uses for his diary entries. He writes with iron gall ink for the first five pages of the diary (297c/102-06), switches to Zingifure for 41 pages (297c/107-15, 297b/116-19, 297c/120-133, 297b/132-45), employs an ink that appears to combine Zingifure and iron gall for half a page (297b/146), then continues with iron gall for most of the remaining 17½ pages (297b/146-163). 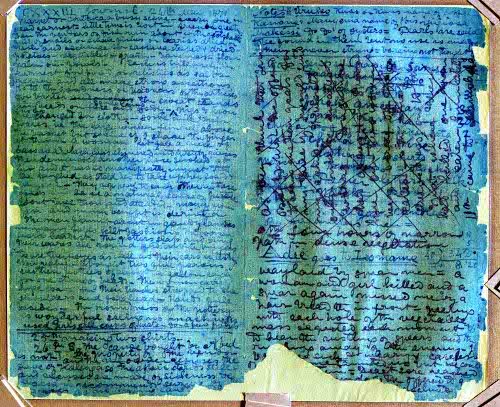 The deviations from Livingstone’s ink use pattern, especially the presence of pages wholly in Zingifure ink near the end of the second copy-book, suggest that Livingstone planned out the overall structure of his copy-books and did not write all his diary pages in a continuous series. Rather, he allocated certain pages for notes and on some of these pages wrote the notes ahead of time, hence the presence of Zingifure ink in those sections of the diary where he was otherwise using iron gall (see 297b/157, 297b/158, portions of 297b/162, 297b/163). Other pages he left blank for notes, but as he came to the end of the diary he ended up using them instead for diary entries in iron gall ink (207b/159, 297b/160, portions of 297b/162). Figure 1. Livingstone, 1871 Field Diary, 297b/133-162, spectral ratio. The deleted area of interest is on the upper right-hand side. These practices help account for the unusual textual configuration of 297b/162. Livingstone, it seems, designated this page for a note and initially jotted down a few observations as well as a list of supplies needed in Zingifure ink. Later when he had filled the preceding pages with entries in iron gall ink, he returned to this page and wrote across the bottom portion of the page. Next, he turned the page 90 degrees clockwise and wrote additional entries in iron gall ink over the Zingifure note already at the center of the page. Finally, he crossed out the entire central section of the page using iron gall ink. As a result, iron gall and Zingifure ink cover 297b/162 in almost equal proportions, the text contains both "note" and "journal" entries, and the resulting manuscript page presents the reader with no less than four textual layers: the text of The Standard, the note in Zingifure, the diary entries in iron gall, and the cancellation in iron gall. detail: color image (left); spectral ratio (right). The above only applies to Livingstone’s use of ink in the diary entries proper. The inking of his headers (his page number succeeded by the word "Journal" or "Note") follows a different pattern. He uses iron gall for the first six headers (297c/102-06), then switches to Zingifure for the rest of the diary without exception, even on the later pages that are otherwise composed with iron gall ink or with a combination of Zingifure and iron gall. 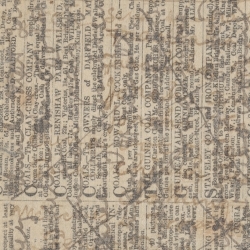 This pattern indicates that Livingstone began pre-numbering the pages of the diary at some point during its composition. spectral ratio. Header with both Zingifure and iron gall ink. 297c/123-31, first copy-book Livingstone’s page number & "Journal"
297c/132-133, first copy-book Livingstone’s page number & "Note"
297b/132-56, second copy-book Livingstone’s page number & "Journal"
297b/157-58, second copy-book Livingstone’s page number & "Note"
This configuration indicates that Livingstone may have begun pre-numbering his pages with the first page of this sequence, 297c/123, or with any of the pages up to 297b/146. On the latter the use of the combination of Zingifure and iron gall ink for the main diary entry first reveals that Livingstone is pre-numbering his pages. (The initial run of headers, 297c/102-15, 297b/116-19, 297c/120-22, and those at the end of the diary, 297b/159-63, take a more complex, but less structured form and will be discussed in the following pages). Additional study of the inks and their ink spectra may yield further information. Click here to open a window showing all of Livingstone’s headers.